There will undoubtedly come a time when we have a cure. For now we have love, comfort and recording our loved ones' stories in life story video. 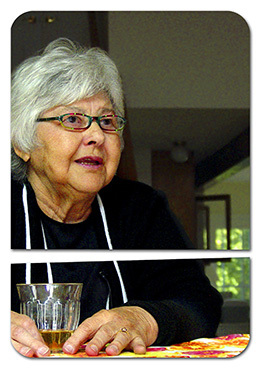 Our work includes projects involving memory loss. This the case study of a lovely lady (Frances - left) suffering from Alzheimer's disease. We must admit that when we got a call about creating a family history video for a subject with Alzheimer's Disease, we doubted that anything could be done. After all, the work we do is preserving memories on video for the following generations. The little we knew then about Alzheimer's - a terrible disease that destroys memory - made me think that we were being asked to photograph the invisible man (if you know what we mean). Nor had we heard of an increasingly discussed treatment regime called "reminiscence therapy". "Oh you'll have to meet my Mom," the client said. "She will forget she even met you before you make it back out the front door!" She was a typical client in our business - a daughter who truly adored her mother. We had already heard about her mother's drug regime, the dire prognosis. Our concerns were magnifying. Definition of "Reminiscence therapy" - using prompts, such as photos, music or familiar items from the past, to encourage the patient to talk about earlier memories and generally offered to people in their later years with mood or memory problems, or those needing help dealing with the difficulties that come along with aging. So we met Frances. We already knew that she was born in Louisiana and had moved to LA when she was 20 or so. We found out that she had a lovely, soft southern accent and a lyrical, wistful way of making conversation. But she did seem a little vague and distracted (she kept looking at a History Channel video that was playing over our shoulders). We started with photographs - old photographs. We had read that Alzheimer's attacks the short term memory first and we were hoping that the older memories would still be in tact. We held our breath. By the time we came to set up for the video interview a week or so later, Frances was ready. Around 80, beautifully dressed and very proud; a handsome, composed woman. We had been given a number of areas the family wanted covered. She listened carefully to each question, looked quickly at the photographs, and told her stories. As the afternoon wore on, we became more and more astonished. Her memories of her large Italian-American family, of growing up on a strawberry farm and placing pine needles around the plants, of wandering in the local woods, of stealing into the one room school to "sample" pastries, of the love the local people felt for Huey Long, of the separation of her parents - were all detailed and fresh. 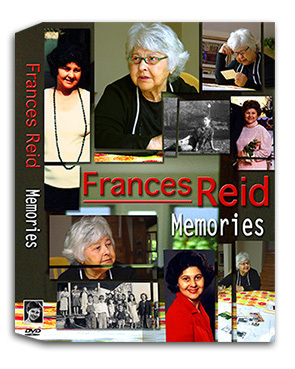 The room seemed to close in around us as the afternoon wore on and Frances recalled her young life. We asked Frances about some more recent events and it was obvious that she was totally blank. Our final question was about her health (good) and about her memory. "Well, I answered your questions pretty good didn't I?" Yes, she sure did. We called her family history video "Memories". Family history video is a kind of immortality - memories recorded on DVD video, properly preserved, will last forever. And the delight that is people like Frances will live on for families and all their following generations. Memory loss need not be forever. Memory loss affects well over 5 million Americans. But we don't have to sit back and watch it happen - there are steps we can take to preserve important family memories. The Mayo Clinic says that caregivers for people with memory loss become their stand-in memory. And it is up to them to help create external repositories for their memories - like DVD video. "You may want to start by reminiscing with your loved one about his or her family history, traditions and celebrations. "Often, childhood games, homes and pets are good opening topics - especially as Alzheimer's progresses and your loved one has trouble remembering recent events. "You might also talk about favorite sports, books, music and hobbies, as well as cultural and historical events."